There is now an intelligibility of the need for sustainable increase in yield often referred to as “Revolution”. In the context of moving away from the earlier paradigm, two pathways are advocated by two distinctly different schools of thinking. On the one hand, there is a strong propaganda from the global seed companies that control the patents of Genetically Modified Organism (GMO) technology that this is the “Ever Green Technology” that is essential to provide food security and higher incomes. —Section I deals with agricultural situation in India between 1960-1998. —Section II examines Inorganic (GMO Crops) Farming since mid-1990s. —Section III is about Organic Farming—Status and Trends. However, the conditions in Indian agriculture are deplorable; besides, productivity of land as well as agricultural worker had declined and was comparatively lowest in the world. In spite of the fact that over 70 per cent of the working population was engaged in cultivation, the country was facing foodgrain shortage and had to depend on large imports of foodgrains. Subsequently it was understood that for reinvigorating Indian agriculture there was no alternative to technological changes. The new technology substituted traditional robust but low yielding varieties of seed by the exotic high yielding variety (HYV). This created a heavy demand for chemical fertilisers to supplement the natural fertility of the soil, because these new varieties contain nutrients in concentrated form; they have to be applied with adequate supplies of water to enable the plant to absorb them without damaging itself. The use of chemical fertiliser for increased productivity started in 1950. From 1966 to 1990, India recorded substantial achievements in agricultural production in different phases. A radical change in foodgrains production between 1966-1972 enabled India to become self-sufficient, foodgrains imports declining to nearly zero. This also helped a rise in the farmer’s income, while output growth and increased foodgrain supplies caused a decline in real foodgrain prices, benefiting the poor. Thus, rural poverty declined significantly in this phase. The HYV programme was initially experimented in wheat in the States of Punjab, Haryana, Rajasthan and Western UP. Later on it was extended to rice in certain selected districts in AP, Tamil Nadu, Karnataka and Maharashtra. Later, in early 1980 the HYV technology spread eastwards to States like West Bengal and Bihar which experienced surpluses in rice. However, in the rest of the country the Green Revolution ran out of steam by the late 1980s. It was realised by the late 1990s that there are limits to increasing the foodgrains production through increase in the area under cultivation because the country has reached almost a plateau insofar as cultivatable land is concerned. (Table-I) The contribution of high yielding varieties, which has been the basis of the Green Revolution in the seventies, has now plateaued and there is hardly any fresh contribution to growth in yields. The experience in the eighties and nineties also lends support to the thrust of the findings. During the eighties, the growth rate trend of 3.5 per cent in agricultural production appeared to have contributed to accelerated industrial production. The decelerated growth rate in agriculture production seems to have impacted on the growth of industrial production in the nineties. The global population was around 1.6 billion in 1900; today it is nearly 7.2 billion. The recorded population of the Indian subcontinent was around 271 million. The average life-span at birth in India in 1900 was 23 years; today it is around 65 years. For a while, imagine a world in which medical revolution would have occurred, but agriculture would have stayed frozen at the 1900 levels, that is, no chemical fertilisers, no agro-chemicals for crop protection, no mechanisation and no systematic agri-research. A health revolution sans agricultural revolution would have caused massive star-vations, untold human misery and rise of extreme ideologies. Two major technologies—dwarfing genes and hybrids—increased crop yields in a big way and saved the world from severe food shortages and famines in the 20th century. By the 1990s as the fruits of HYV started petering out, many rich farmers were looking out for other methods. At the same time MNCs experimenting in inorganic (GMO Crop) farming were vehmenty trying to enter India through the joint venture route. The World Health Organisation defines GMO as “organisms in which the genetic material (DNA) has been altered in a way that does not occur naturally”.7 The first genetically modified organisms (GMO) field trials were conducted in the case of sunflower in 1990. Later, an American seed giant, Monsanto, introduced Bt. Technology in India in cotton (1995) and brinjal (2005). India’s leading seed company, Maharashtra Hybrid Seed Company better known as MAHYCO, licensed and used the gene obtained from Monsanto. MAHYCO signed an agreement to develop Bt Brinjal with two agricultural Universities, University of Agricultural Science (USA) in Dharwad (Karna-taka) and Tamil Nadu Agricultural University (TNAU) in Coimbatore. The study is significant for two reasons: first, most cotton cultivation in India is rain-fed, and second, between 2002-2010 the adoption of Bt Cotton hybrid went up significantly to 86 per cent of the total cultivated area of cotton in India. Monsanto’s royalty extraction and cost of purchased seed and chemicals created a debt trap. The Research Foundation for Science, Technology and Ecology sued Monsanto in the Supreme Court of India. The panel of technical experts, appointed by the Supreme Court, recommended a 10-year moratorium on field trials of all GM food and termination of all ongoing trials of transgenic crops. The reaction of farmers to this new techno-logy had been mixed in the initial stages. Some farmers quickly adapted the technology. Other farmers, mindful of the controversy surrounding GMO crops, hesitated to use GM seeds as part of their agricultural operation. GMO technology may be more appropriate for farmers who face difficulties in spraying pesticides and herbicides. GM seeds may work well for farms that are highly mechanised and close to water bodies. It is clear that India recorded a tremendous growth of agricultural production in the era of the Green Revolution (GR). In spite of the fact that food security of India was definitely addressed by the GR technology, an important setback was that farmers using such technology still have to depend on purchased inputs— chemical fertilisers and pesticides. Due to many advantages of organic farming over the modern agricultural practices that the former is drawing the attention of farmers across globe. Organic farming system essentially encompasses supportive biological processes without the intervention of inorganic remedies such as chemicals or bio-technological intervention like genetically modified organisms (GMO). The concept of organic farming has been given a special relevance in Rig Veda. Commercialisation of agriculture has been found to have a negative impact on the environment. An interesting fact is that fertilisers have a short-term effect on produc-tivity but on the contrary have a long-term negative effect on the environment. In the name of meeting the ever increasing needs of population growth, we have taken a wrong turn of unsustainability. 1. To work as much as possible within a closed system, and draw upon local resources. 2. To maintain the long-term fertility of soils. 3. To avoid all forms of pollution that may result from agricultural techniques. 4. To produce foodstuffs of high nutritional quality and sufficient quantity. 6. To give livestock conditions of life that to their physiological need. 7. To make it possible for agriculture producer to earn a living through their work and develop their potentialities as human beings. More than 60 per cent of India’s arable land is under traditional agriculture where no synthetic inputs are being used. Although the products grown under such systems have so far not been defined as organic products but by any measure they are genuine organic products. The renewed interest in organic farming in India is mainly due to three main reasons: reduction in agriculture yield in certain areas as a result of excessive and indiscrimination use of chemical inputs, decreased soil fertility and a concern for environment. 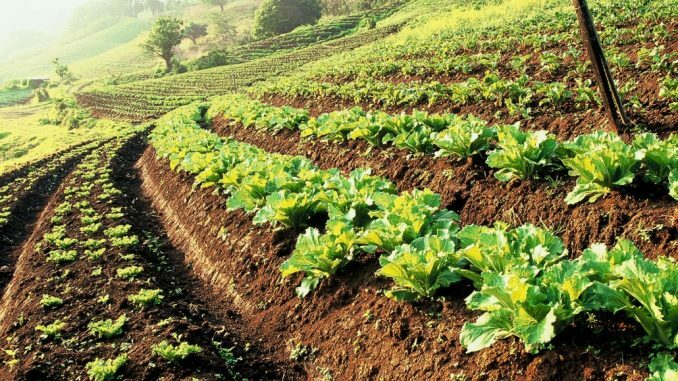 Organic agriculture is now practised in more than 170 countries with a total area of 43.1 million hectares by two million producers of organic farm. This constitutes about 0.70 per cent of total agricultural land of the world. (Table-III) The global demand for organic products remains robust, with sales increasing by over five billion US dollars a year. The Indian States involved in organic farming are West Bengal, Karnataka, Uttarakhand, Sikkim, Rajasthan, Maharashtra, Tamil Nadu, Madhya Pradesh, Himachal Pradesh and Odisha. 1. Organic farming helps in maintaining environ-ment health by reducing the level of pollution. 2. It reduces human and animal health hazards by reducing the level of residue in the product. 3. It helps in keeping agricultural production at a level and makes it sustainable. 4. It reduces the cost of agricultural production and also improves the soil health. 5. It ensures optimum utilisation of natural resources for short-term benefit and helps in conserving them for future generation. 6. Organic farming not only saves energy for both animal and machine, but reduces risk of crop failure. 7. It improves the soil physical properties such as granulation, and good tilth, giving good aeration, easy root penetration and improves water holding capacity. 8. Besides, organic farming improves the soils chemical properties such as supply and retention of soil nutrients and promotes favorable chemical reactions. Apart from this, it has been demonstrated extensively that plant products from organic farming are substantially better in quality like bigger in size, look, flavour and aroma. Animal products are of better quality when they are fed with feed and fodder produced organically. The underground water of the area where organic farming system is in practice has been found to be free of toxic chemicals. Though 50 per cent of the organic food production in India is targeted towards exports, the domestic consumption has been rising for the last one decade. Domestic demand is low for the simple reason that organic food is priced over 25 per cent more than conventional food in India. But now good numbers of people are willing to pay this higher premium due to the perceived health benefits of organic food. It may be noticed that even though the production cost of organic farming is low, yet the cost during the initial transition from chemical farming to organic farming is quite high. Currently most of the organic farmers in India are still in a transition phase and hence their costs continue to be high. As these farmers persist with organic farming, the production costs are expected to reduce making India one of the most important producers of organic food. Many studies have revealed that organic agriculture is productive and sustainable, organic food production costs are higher in the developed countries as organic farming is labour-intensive and labour is costly in these countries. But in a country like India, where labour is quite abundant and relatively cheap, organic farming has immense potential. With agriculture as the backbone of the Indian economy supported by the fact that nearly 67 per cent of India’s population and 55 per cent of the total workforce depend on agriculture and other allied activities. Indian agriculture reached its heights with increasing area under cultivation, productivity and foodgrains production. Thus food security is being taken care of. In India a little more than half of the total landmass of 328.73 million hectares, that is, nearly 182.46 million hectares (55.5 per cent) is used for agriculture. Still nearly 44 per cent of the landmass can be used for farming purposes in a sustainable manner. As India entered globalisation and reforms were initiated, Indian agriculture faced difficulties. Hitherto, the government had supplied nearly all agricultural inputs at highly subsi-dised rates that resulted in a kind of revolution in Indian agriculture. The cheaper availability of inputs was supposed to increase the consumption of fertilisers and land under irrigation facilities so as to increase the total foodgrains production by increasing the yield and area under cultivation. With the cut in subsidies, input costs hiked for farmers and thereby farming became a costly proposition. Production of foodgrains is more significant due to two reasons. First, it provides the base for subsistence by supplying basic food items, and secondly, it is the only group of agricultural produce where the ‘Green Revolution’ was introduced firstly and more successfully. The successful implementation of the Green Revo-lution and land reform not only increased the productivity but also increased the area under cultivation that paved the way for a higher growth of the agricultural sector. Since it is proved by many economists and policy- makers that there is strong correlation between increase in agricultural output on the one hand, and increase in industrial production and national income on the other, India has to look for better farming techniques, as it has to feed its large population. By the late nineties, it was acknowledged that the ‘Green Revolution’-type of agricultural development based on HYV, supported by chemical fertilisers, pesticides and excess use of irrigation, has over the years had a ravaging effect on agro-climatic conditions and also resulted in stagnating yields with high inputs and indebtedness for many. For the last three decades, agricultural scientists and economists are propounding the concept of an ‘Ever Green Revolution’. In this context, two views emerged, one is modified inorganic (GMO crop) farming and the other is Organic farming. GMO farming requires more water than the traditional seeds—seed companies have invested a huge amount of funds in the research and development of GM seeds and protect this investment through their contracts with farmers. As a result, the firms started collecting significant amounts in the form of royalties. In India GMO farming in cash crops, like cotton and chilies, created a disastrous situation leading to suicide of more than 2,00,000 farmers. For the last two decades, the governments, irrespective of their political learnings, have not done anything substantial for development. People, with higher food safety, better health and training, can contribute to improved productivity in major segments of the economy, namely, agriculture and industry. This will lead to a better quality of life for all people enabling the country to achieve the ideal of welfare in a liberal, mixed economy.